Closed Loop PID temperature control with visible LED display. LCD display programmable pressure switch for precise force control. Each heating cycle is triggered by a real time pressure sensor. Floating thermode ensures consistent pressure and heat transfer between the thermode head and the parts to be joined. Silicon rubber can be fitted in bonding Heat Seal Connectors between LCD and PCB. Standard workpiece holder is mounted on a linear guideway and designed to allow for easy changeover and repeatable operation. 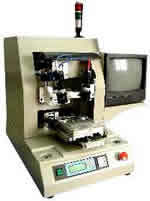 Parts registration is adjusted by micrometer and secured by vacuum lock. Optional CCD system for fine pitch component. LED display Closed Loop PID temperature control. Floating Thermode ensures consistent pressure and heat transfer between the thermode and the parts to be joined. 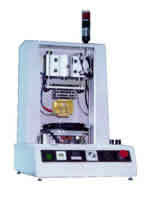 Workpiece holder is mounted on a turntable and designed to allow for easy changeover and repeatable operation. 2 workpiece holders are mounted on the rotary table, the production volume can be increased by more efficient loading and unloading operations. Parts registration is adjusted by micrometer and secured by vaccum lock. Unique pulse heat technology provides fastest soldering head heating. 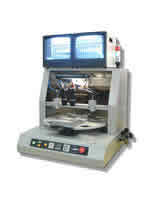 Programmable soldering temperature, heat-up rate and time duration for a wide range of products. Thermocouple is fixed in close proximity to the working surface & the thermode, thus providing accurate temperature feedback control. Closed Loop PID temperature control with clearly visible LED display. Soldering time can be programmable and is triggered by temperature. Programmable pressure switch with LCD display for precise force control. CCD camera system with magnification lens can be retrofitted for fine-pitch positioning.